Jimmy won't be taking losing sitting down for long. Are you watching this, Jimmy Haslam? Do you taste the bitter gruel that Browns fans have been choking down for what seems like forever? Sunday's loss against Buffalo was classic New Browns: Take a decent amount of momentum from the week before and have that small bit of impetus come to a crashing halt during a winnable game at home. 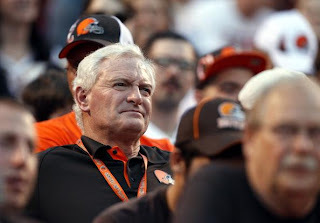 Owner-to-be Haslam is new to Browns football but the fans have seen this horrorshow in a continuing loop for 14 years. This team doesn't have the talent to win consistently, but the lack of preparation evident last weekend is another thing all-together. Haslam had an eagle-eye view of the carnage from the CBS broadcast booth during a brief interview. Did he see what beleaguered Browns backers have watched through a blinding mist of tears for seasons beyond counting? The Bills lose their best player on offense (running back CJ Spiller) and the Browns can't take advantage. The team's quarterback play is suspect, the wideouts can't catch, the offensive line is porous, the defense can't get off the field and the coaching staff's play-clock management leaves much to be desired. Any reasons for optimism engendered by the first two weeks have evaporated into nothingness. It's embarrassing for Cleveland fans and it's gone on way too long. Haslam is no fool, and if drowning Browns fans need a lifeline, he is all they have to grasp at right now. Coach Pat Shurmur was already a dead-man walking after it was announced Haslam was going to purchase the organization. Through his unique brand of monotone incompetence, Shurmur has been kind of enough to provide his own rope for the inevitable journey to the gallows. Team president Mike Holmgren will be out one way or another by the end of the year, and even general manager Tom Heckert, the one front office member who it was thought could survive the ownership turnover, may be sacked as well. Anything is possible with the Franchise of Perpetual Rebuild. A full-scale fumigation probably has to happen even if it means yet another front office reconstruction. That's because the Browns don't just have a losing team, they have a losing culture. The former may take a good draft or two to fix. The latter can hang on for years, if not decades. Haslam will have to be the man to bring the Browns back to relevance. He will have to be the one to say, "Enough is enough." Column originally appeared on Examiner.com.